(Bloomberg) -- The lawyers representing Venezuela in some U.S. legal disputes just switched sides. In a strange twist, the American attorneys have asked a federal judge to delay a case involving a Canadian gold producer after Venezuelan opposition leader Juan Guaido claimed the country’s interim presidency, though Nicolas Maduro remains in control. The Washington, D.C., law firm Arnold & Porter Kaye Scholer LLP previously took orders from Maduro’s government, but that changed after U.S. President Donald Trump officially recognized Guaido on Jan. 23. “President Guaido’s government has instructed us to file this motion,” the firm said yesterday in the filing with the federal court of appeals in Washington. 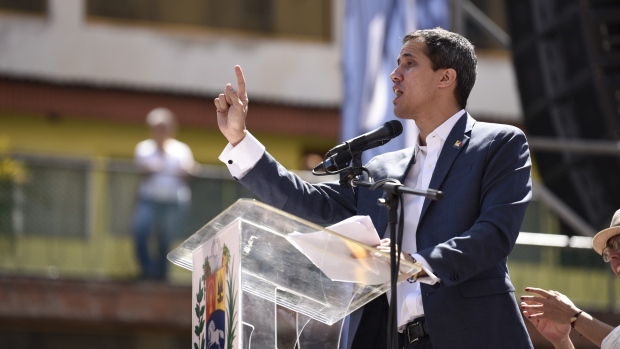 Delays are necessary to allow the interim Guaido government “sufficient time to evaluate its position” for cases in U.S. courts, according to the filing. The case turns on a demand by Rusoro Mining Ltd. for compensation tied to Venezuela’s expropriation of its property. “Because the president has recognized President Guaido as the rightful representative of the Republic, only President Guaido or his representatives may assert the interests of the Republic in U.S. courts,” Arnold & Porter said. The firm said it has represented Venezuela in U.S. court cases involving Rusoro and other matters. It sought a delay of 120 days.